His heir, not sharing the old man's passion for book collecting, arranged for an auction to sell off the library, and so a catalog of this small but highly unusual collection was mailed to bibliophiles throughout Europe. The auction, the collectors were told, was to be held in the offices of Mâitre Mourlon, notary, 9 rue de l'Église, in Binche, Belgium on August 10, 1840. A manuscript note attributes this work to Pere Felix Grebard, private secretary to the noted Huet, bishop of Avranches. This Pere Grebard is likewise the author of a very rare tragedy, 'La mort de Henry le grand,' which I have had in my collection, but of which I rid myself, having learned that Mons. J. Ketele of Audenarde had another copy of it. On August 9, the day before the auction, the collectors descended on Binche like a pack of vultures. The Belgian government even sent an official representative, believing that the collection was so valuable that it should be bought in its entirety and kept in the country. But only disappointment greeted the hopeful buyers. Try as they might, they could not locate any street named "rue de l'Église" in the town of Binche. Their spirits sunk even lower when they read an announcement in the newspaper informing them that the town of Binche had decided to purchase the entire collection for its public library. Disheartened, some of the collectors returned home, but others stayed, curious to view the unique books in their new home. But although they searched and searched, they couldn't find the library anywhere. Only then did it gradually dawn on them. There was no Binche public library. There was no Comte de Fortsas. The entire auction and list of unique books had been an enormous, elaborately designed hoax. The man behind the hoax was a local antiquarian named Renier Hubert Ghislain Chalon (1802-1889). The planning that had gone into the deception was incredible. He had carefully researched the interests of all the major bibliophiles in Europe in order to ensure that they would make the long and fruitless trek to Binche. And he had done all this merely for the sake of a practical joke. The hoax proved not to be a total loss for its victims. The catalog they had received itself became a highly coveted collector's item. Within a few decades it had more than quadrupled in price. 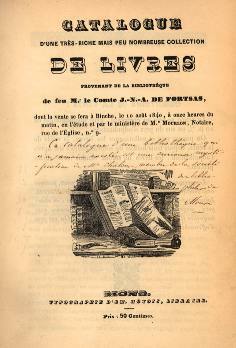 In 1855, M. Hoyois issued a prospectus for a reimpression of the Fortsas Catalogue, with the orders and correspondence of various bibliophiles with regard to the supposed sale, and a facsimile of a letter from the Count de Fortsas. M. Chalons forbade this re-impression, and a division arose between the friends. M. Chalons took legal measures to prevent M. Hoyois from reprinting the Catalogue, and also influenced the Societe des Bibliophiles Belges to refuse their subscription to the book. In the year 1840, the book collectors in Europe were greatly excited by the publication of the sale catalogue of the Count J.N.A. de Fortsas. This little volume of only fourteen pages contained a list of the books which formed the Count's collection, composed of only fifty-two articles, each of them unique. The Count would keep no book in his collection, if he found it mentioned by any bibliographer. No wonder the bibliographical world was excited. The sale was to take place in the office of a notary of Binche, an insignificant village of Belgium. The catalogues were sent to the great collectors of France and England, and each recipient supposed himself specially favored, and each kept his own secret. It is said that Brunet, Nodier, Techener, Renouard and other bibliophiles of Paris met in the stage to Binche, each one having hoped to steal away unnoticed and have the game all to himself. M. Castian, of Lisle, who was greatly interested in the treasures of this sale (particularly in a work published by Castman, of Tournay, relating to the Belgian revolution of 1830, the entire edition of which had been suppressed, this copy fortuitously being saved), seemed a little incredulous about this wonderful collection, and took the precaution to make some inquiries as he was passing through Tournay concerning the book, and called on the publisher. M. Castman had forgotten it, but his foreman recollected it, and the author, M. Ch. Lecocq, perfectly. This at once silenced his suspicions. The Baron de Reiffenberg, then the Director of the Royal Library of Brussels, asked for an appropriation to purchase some of these treasures, which was granted. His commission to purchase covered the entire catalogue, save seven articles which were thought to be too free for a public library. One enthusiastic bookseller made the journey to Binche from Amsterdam, only to see one volume, the Corpus Juris Civilis, printed by the Elzevirs on vellum. The Princess de Ligne, anxious to destroy the record of her ancestor's achievements, and to protect the reputation of the grandmothers of the best families in the state, wrote to M. Voisin to buy No. 48 at any price: "Achetez, je vous en conjure, a tout prix, les Sottises de Notre Polisson de Grandpere." The Roxburghe Club was represented; and, singularly enough, every book from the catalogue appealed with peculiar force to the taste or weakness of some distinguished collector, and each one was the fortunate possessor of a catalogue through the post. Tradition says that the good people of Binche, seeing their town invaded by a rusty and serious-looking set of strangers, all inquiring for the office of the same notary who had no existence, began to suspect some plot against the liberties of the state, and consulted about the propriety of putting as many of them as their limited accommodations would permit under confinement. On the morning of the sale the newspapers contained a notice that the bibliographical world would learn with regret that the library of Count de Fortsas would not be sold, the town of Binche having resolved to keep it together in honor of the Collector, their townsman. The force of the hoax could go no further. For the whole affair was a hoax. The Count de Fortsas was a myth -- his chateau, his passion, his success in bibliographical pursuits, were apocryphal. And yet M. Chalons, a French collector, admitted to a stageful of bibliophiles, whom he met on the road, to have had the pleasure of a long personal acquaintance with the count. He is said to have been the author of this witty practical joke. The Fortsas Hoax, University of Delaware Library. Chalon, Renier Hubert Ghislain (1840). Catalogue d'une très-riche mais peu nombreuse collection de livres provenant de la bibliothèque de feu M.r le comte J.- N.-A. de Forstas. Mons: Typographie d'Em. Hoyois, Libraire. Klinefelter, Walter. (1942). The Fortsas Bibliohoax. New York, Press of the Wooly Whale. 1942. The Fortsas Catalogue. (June, 1884). The Bibliographer: A Journal of Book-Lore (June, 1884) No. 31: 8-12.